So I have decided that it is time for a new wood caving project. I really really like making maps and since the EK is getting a new region that will include my shire, I thought a map of the Western region would be a lot of fun. Since I have already done a really straightforward map, I wanted to make something more interesting. 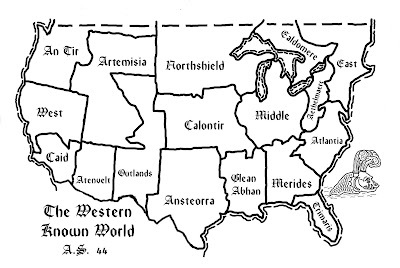 There are period stylized maps that are drawn to fit an image, and I think these are really cool. The Western Region is pretty weird looking, with half of PA and all of DE, which make it a little hard to fit to an image. My current attempt is with a Tiger Couchant (lying down). I’ve done up a sketch, and once I decide if I like it or not, I will make up a complete version in Photoshop. I’d love to know what you think. I was planning on having 2-3 weeks to carve the final woodblock, but of course it didn’t come together until the last minute. I had 4 days to carve, but it all came together in the end. The final print on Arches 140lb hot rolled 100% rag paper. I can see why pear wood was a popular choice for woodblock carving in period. In “Il Libro dell’ Arte”, written in 1437 by Cennino d’Andrea Cennini, pear and nut were mentioned as good woods for woodblocks, and many woodblocks that have survived are believed to be made of pear. The pear wood was a delight to carve and held together very well and supported very fine detail. The wood did not tend to break at the grain, and with sharp tools I was able to carve as easily with the grain as against it, and make smooth curves. For the carving, I mostly used a sharp detail knife, a 4mm and a 1.5mm u-gouge, and a 1mm v-parting tool. I generally outlined the areas I would be carving with the knife, but that wasn’t always necessary, which I attribute to the dense grain of the pear wood. I was not pleased with the tool I used to clear large spaces. I had to press very hard with the palm of my hand and I couldn’t carve as deep as I wanted. I have picked up some new palm tools that will hopefully help. I was not happy with the glues that I used to attach the paper with the image to the block. I could sometimes carve through the paper without it moving, but not always. I usually outlines the details with a sharp knife then removed the paper and drew the details in with a fine tipped Sharpie pen so I could carve out the details. My first test print on regular card stock turned out really nice. My later prints on the better paper did not come out as well. I think this is due to several reasons. 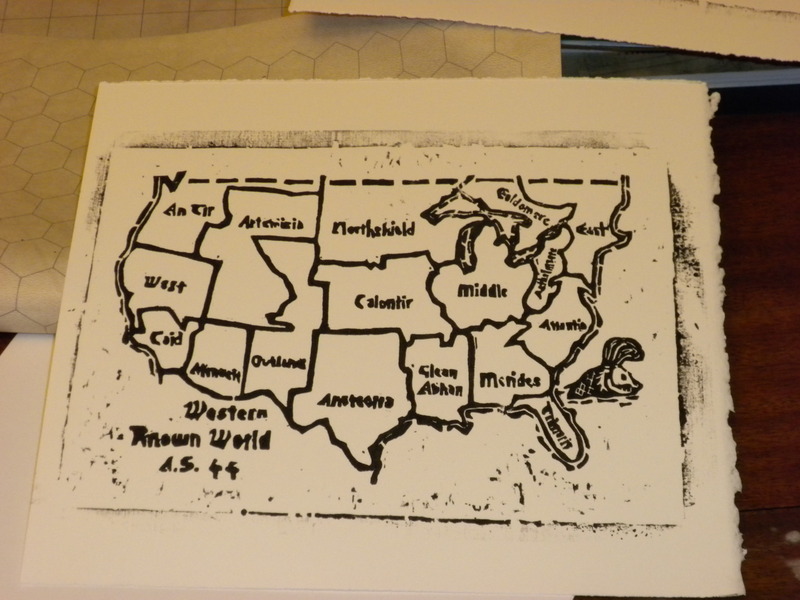 After printing a couple of times the block had a lot of ink on it, and the ink was very thick and tacky. I want to experiment with the water based Speedball ink I used and also an oil based ink from Graphic Chemical to see if I can get better prints. The paper I used for the final prints was also much thicker and stiffer than the card stock. I would like to try with some different types of paper. Since I have some pages from 16th century books I know a type of paper that was printed on. The pages that I have are on much thinner paper than what I used. 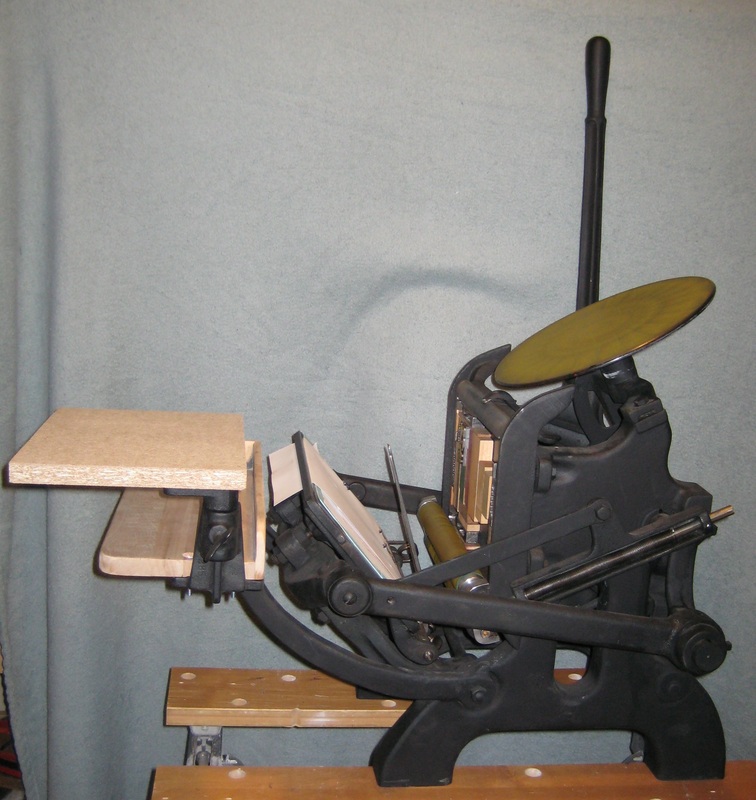 Pear wood was an excellent wood for the purpose of woodblock carving and printing. 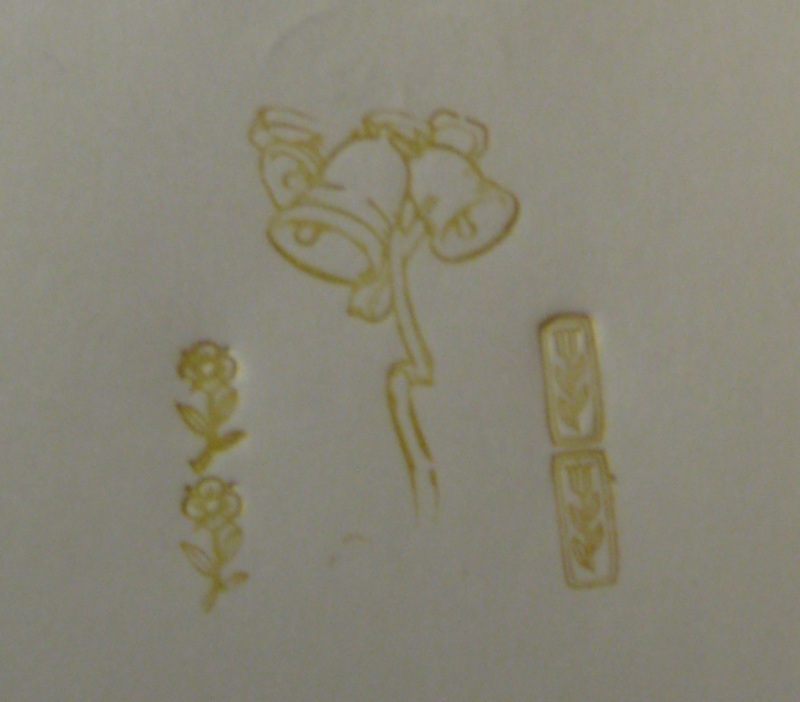 It allowed for fine detail and easy carving, and did not soak up a lot of ink. This project was my first time carving words, and while it was in some ways very difficult, it was not as hard as I had feared. In the future I would use a font that had more space between the letters and more readable and easily carvable capital letters. Overall, I feel like I met my personal goals with this project, and learned more about the techniques of woodcarving. This was my first time entering an A&S compeition, and I was pretty pleased with my final product. I was given some good advice from Iheronimus Bruckner about using a rolling pin to print which I am looking forward to trying. My documentation was not as good as I would have liked, but I think it hit the main points. I was pretty pleased with my judging results, but some of the comments from the judges did not make sense to me. 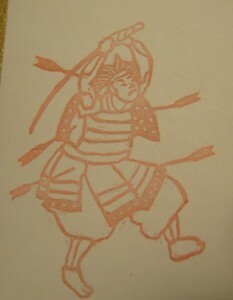 They seemed to think some of the prints I showed images of were engravings not woodblocks, but I don’t know which ones. I also do not think that they read my documentation since one of the questions was answered in the documentation. I think I may try including an abstract on the cover so if people don’t want to read my documentation they can still get a better sense of my project. I was advised by one of the judges that if documentation is too long, judges often don’t read it, but for my own use, I want to have detailed documentation that I can refer to later. Since I do this stuff entirely for myself, I don’t intend to ever put less into my documentation. I was super pleased and shocked with the results of the competition. There were around 50 entrants and 2 different categories, then and now. The then category was for projects done more than 5 years ago, the now was for recent projects. There were a lot of amazing projects for both categories. In addition to the two categories there was also a populace choice award, which I was amazed and honored to win. The populace choice was decided by the number of beads placed in a cup at each entry. The number of beads (votes) each person got to place was determined by their level o award in the SCA. People like me got 1 vote, those with high orders of merit got 2, peers got 3 and royal peers got 4. 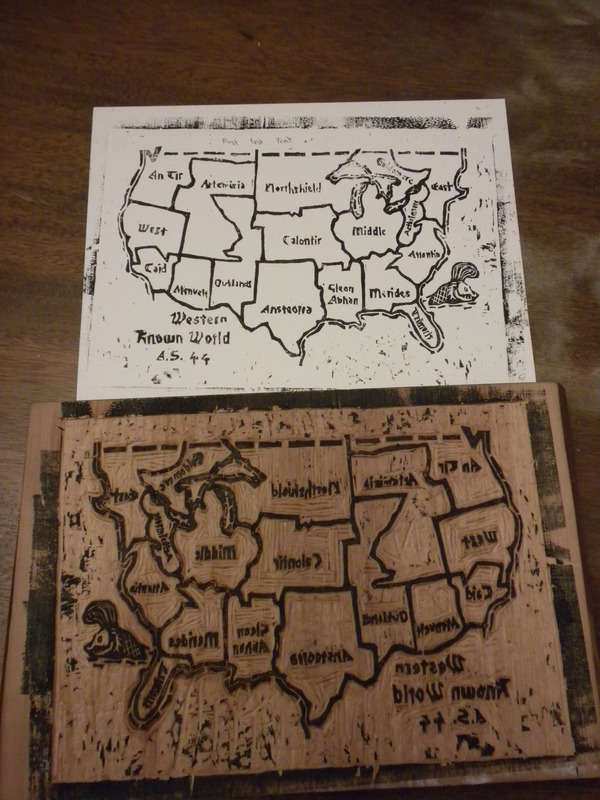 Some progress on the map project. I was able to get hold of some pear wood from Hearne Hardwoods, a wonderful place with all different species of hardwood. The piece was 2″ thick and very curved, so I had it planed down and it is now about 1.5″. The board is 12″ wide on one side and 13″ wide on the other, with a large crack 3″ from the edge. I have 2 feet total and am working on an 8″ section. I sanded the section I am working on first with 100c grit and then with 150c grit. 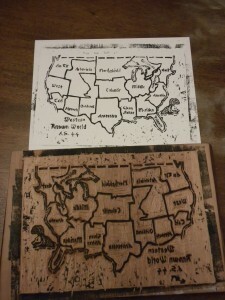 I have tried two modern methods for transferring the image onto the wood. I photocopied my image, covered the copy in rubbing alcohol, and then laid it image side down on the wood and pressed on the back with the barren as if I was printing. This failed to transfer anything. Then I tried using the photocopy as an iron-on. 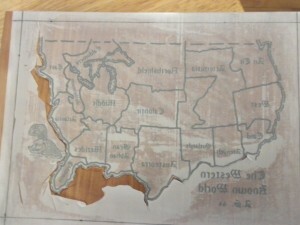 This transferred some of the image, but not enough or clear enough to be useful for carving. Due to the difficulties with the modern methods, I decided to use a period method. 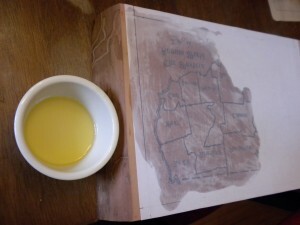 Gluing the paper face down and then coating the back with oil. This method is described as a way to make tracing paper, in “Il Libro dell’ Arte” (The Craftsman’s Handbook by Cennino d’Andrea Cennini which was written in the 15th century and is a guide to the methods of painting. I am using a translation by Daniel V. Thompson, Jr. originally published in 1933, republished by Dover in 1954. The making of and use of tracing paper is on pages 13-14. 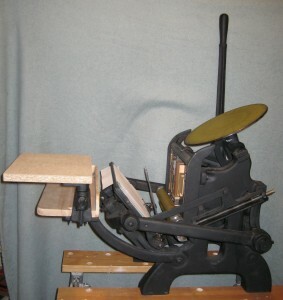 This book also mentions pear or nut is the best wood for woodblocks on page 116. I glued the image down with a modern washable glue stick. I am not sure if I have to worry about getting all of the paper off when it is time to print, but I figured that may be easier with a washable glue stick. I also wanted to be able to get rid of any excess glue if necessary. I am now carving the image. I am using a Flexcut mini detail detail knife, two Flexcut v-parting tools, a 4mm and a 1mm, and several Dockyard Model Company micro carving tools sized 1.5mm and 3mm. 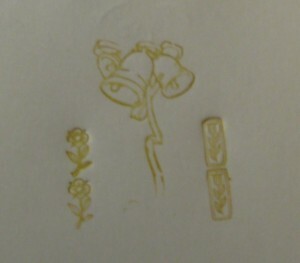 I am mostly using the U-gouges from those sets. 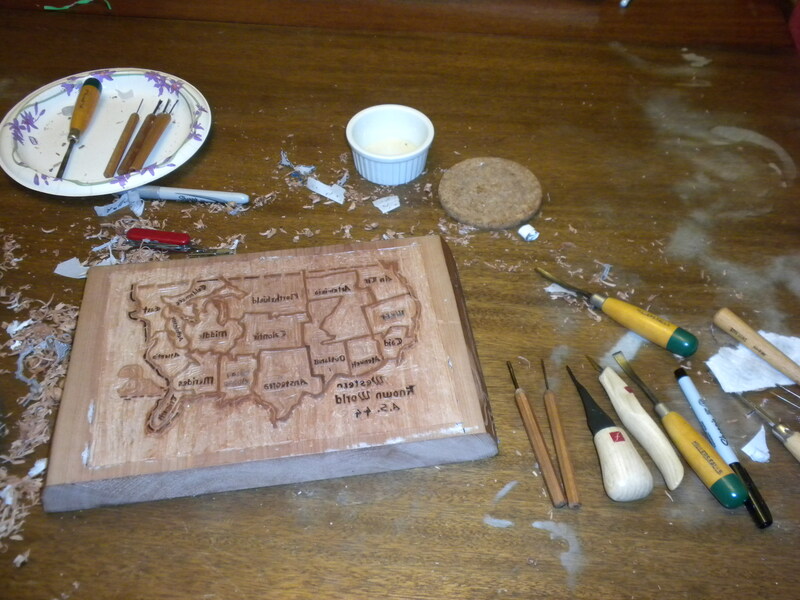 Carving is a little slow going, and I did not use enough glue everywhere on the paper, so I have reglued some areas. 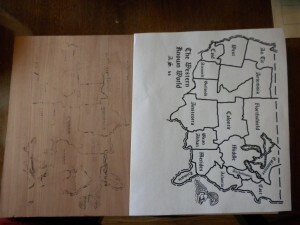 I am still working on the outside border of the map, and have not attempted the words yet. I think I may go over the words on the paper in a fine tipped Sharpie marker to make it easier to see. The Sharpie does not bleed or feather when used on the oiled paper and it still writes fine. I have made some changes and some progress to my map. I have taken out the second lines between the US and Mexico. Even though Mexico isn’t part of the KW I didn’t want to use the same type of lines that I use to show water elsewhere on the map. 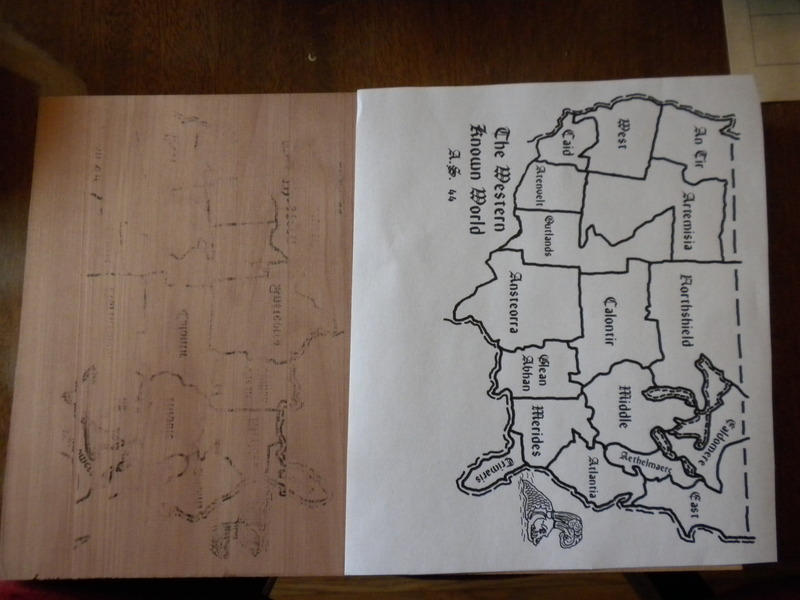 I also made the boarder at the top of the map a dotted line instead of a solid line since it splits some of the kingdoms. I don’t have the space to include all of Canada in the map, but I wanted to make sure it was clear that some of the kingdoms continue north. I also added kingdom names to the map. I am using a font called RememberReinerFS which I got from the site www.dafont.com. Dafont is a great site for very nice and often free downloadable fonts. I chose Remember Reiner because it was easy to read, looked reasonable to carve, and I liked the look of. I do not know if it is based all or in part on any period hand or font. There are still a few things I need to decide before going forward. 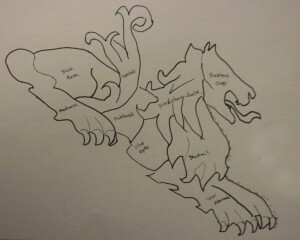 Here is what I have so far. 1. Do I include inter-kingdom war sites? Many areas are very crowded already, especially Aethelmaerc, is there room for an image at each war site? 3. How should I sign it. Should I come up with a new makers mark? Should I edit the makers mark that Michel and I have, and if so, how? 4. Are the dotted lines ok at the top of the map? 5. Should I change the fonts so that each kingdom name more or less fills the space? 6. Are the kingdom labels that are at an angle ok? 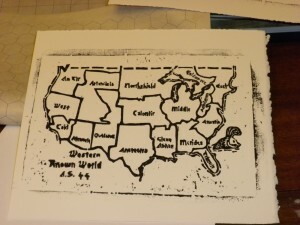 I am making a woodblock printed map of the US portion of the Known World for this Mudthaw (2010). 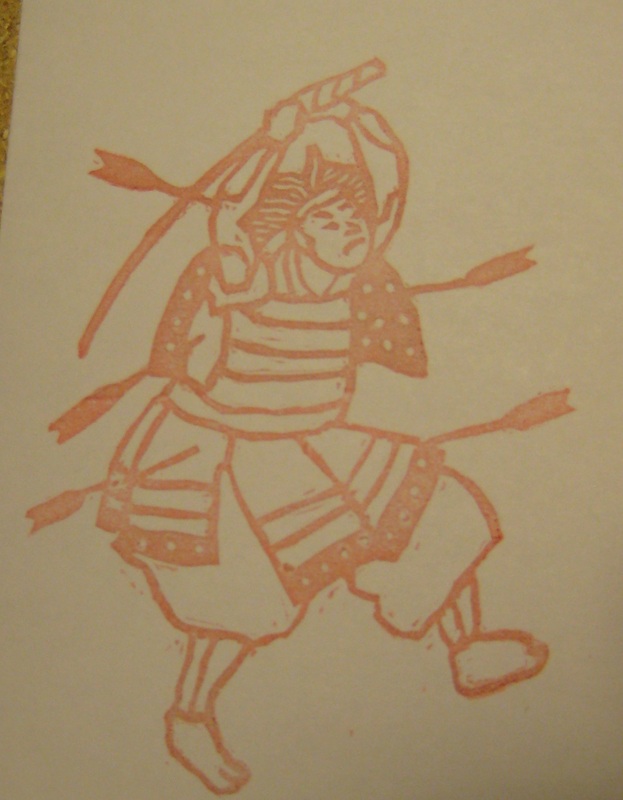 This will be my third woodblock project, the first being a set of face cards for a deck of playing cards, and the second a very simple bookmark for a local event. This is the first one I am doing on my own; I partnered with Michel Wolffauer for the others. Since I cannot draw, I am creating the image that I will be using in Photoshop and will be transfering it to the wood to carve. I will be using a plank of cherry wood that is 6″ tall and as wide as I need, probably around 8″. 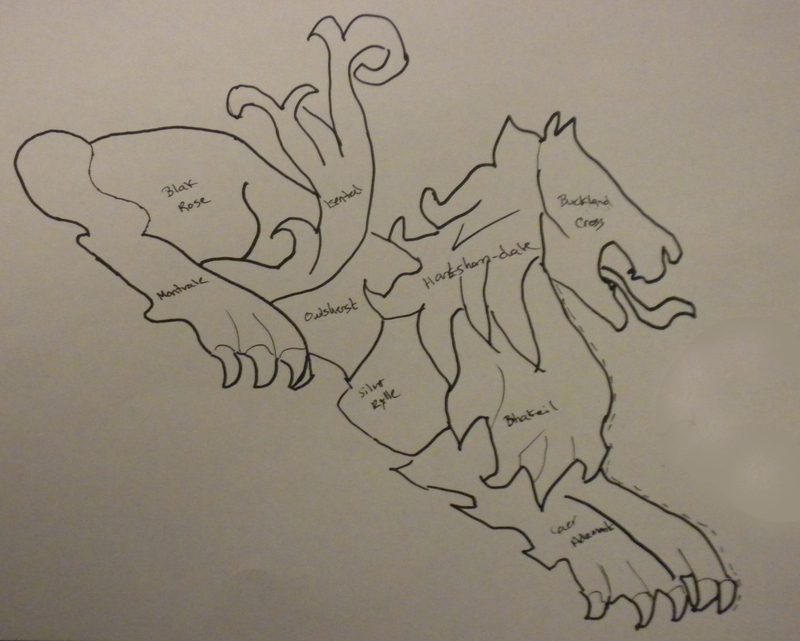 So far I have gotten the outlines done including all of the kingdoms outlined, and I have put a sea monster off the coast. I have a couple things that I need to decide still, but here is what I have so far. Here are some questions that I am thinking about now before I go forward. 1. Do I put the water lines around the boarder between the US and Mexico. I know there is no water there, but Mexico is not part of the Known World? 2. Which inter-kingdom wars do I include? 3. Do I try to fit the entire kingdom names in each kingdom or make a key and have them elsewhere? The problems with putting it elsewhere is it makes the woodblock much bigger if I do it all on one block (could do 2 blocks though). It is also a lot more carving. 4. 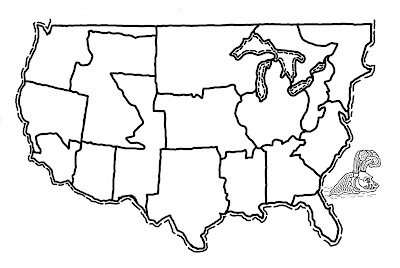 Do I have a solid line at the top of the US, a dotted line, or no line? Many of the kingdoms actually extend up into Canada, but I have chosen not to include all of Canada in my map. I am hoping to give myself about 3 weeks or so to get the block carved so I don’t have to rush. I have never carved words before and I expect it to be pretty difficult.